Ann Atcherley [ ] and her sister Eleonora [ ] were daughters of Captain James Atcherley of the Royal Marines, and his partner Sarah Perkins. James was married, but not to Sarah: he had children both in and out of wedlock. As for Ann and Eleonora, their marital histories were very different to their father’s, and to each other’s. Of the two Atcherley sisters, it was Ann who pursued the traditional path when it came to marriage. On Christmas Day 1838 she married Henry Dennis [ ], a cabinet maker, at Newington St Mary in Surrey. The witnesses were both members of Henry’s family: George (possibly Henry’s father, who was also a cabinet maker) and Elizabeth Dennis. Ann’s father James was recorded as a Mariner. Both Ann and Henry described themselves as being of “full age” when they wed, which was common practice back then. Ann, however, was 25, having been born in Southwark on 29 August 1813. Henry, meanwhile, was 30; his birth had taken place in Clerkenwell, Middlesex, on 28 October 1808. It appears that Ann and Henry Dennis led fairly unremarkable lives. The censuses from 1841 to 1871 track their movements (mostly within Surrey), and the addition and progress of their children. Henry worked as a cabinet maker for the whole of his adult life, before passing away at the age of 69 in 1878. 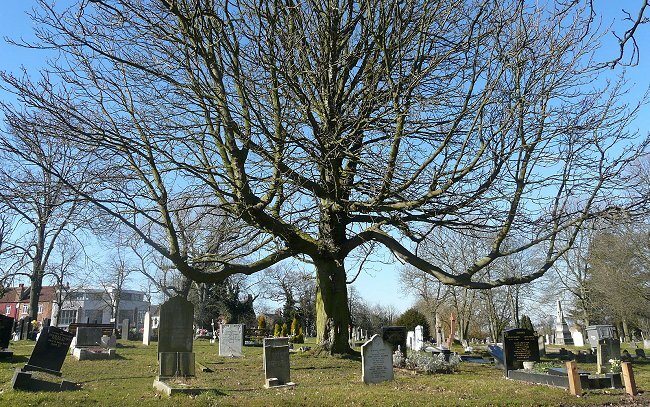 He was buried on 4 June that year at what is now known as Camberwell Old Cemetery. The 1881 census shows the widowed Ann Dennis in the home of James Parsons and his family. Working as a nurse, 67-year-old Ann was probably tending to the latest addition to James Parsons’s family, 4-day-old Samuel. Just over a year later, Ann was dead. She was buried at the same cemetery as her late husband Henry (though not in the same plot), on 26 April 1882. The burial register recorded her abode as 118 Gloucester Road, Peckham, at which address two of her sons, plus her daughter, son-in-law and grandchildren (the Tilley family), were enumerated on the 1881 and later censuses. Although Ann and Henry Dennis seem not to have led lives of great interest, it is thanks to them that there are living descendants of Captain James Atcherley and Sarah Perkins, at least two of whom have taken an active interest in tracking down their Atcherley ancestors. Indeed, if we trace the Dennis family’s descendants we find several more who kept the memory of James Atcherley alive. The Dennis surname was not passed down by any of Ann and Henry’s children. The couple had four sons – Henry [ ] (1939 – ? ), another Henry [ ] (1841 – 1856? ), Robert [ ] (1852 – 1907?) and Frederick [ ] (1857 – 1881), but none of them married. All three of Ann and Henry’s daughters, however, were wed, and two of them had children (and grandchildren, and … well, you get the picture). Another Tilley line descends to a 3x great granddaughter of Captain James Atcherley, who has done her bit towards the entente cordiale between the countries which fought at Trafalgar by marrying a Frenchman! The Atcherley name was also perpetuated (after a fashion) by the third daughter of Ann and Henry Dennis, Emily [ ], who was born around the beginning of 1850. On 27 July 1876, she married police officer John Thomas Preston [ ] (1851 – 1913). It appears that this couple attempted to honour Emily’s maternal grandfather when they named their tenth and last child. They didn’t quite get it right however, because child number 10 was named Frank Atchley Preston [ ]. Close, but no cigar (although, as you will soon see, there is more to tell regarding this Preston family). There was greater success with some of Emily and John’s grandsons – a hat-trick in fact. Emily Preston [ ] (1878 – 1957), named after her mother, married Sidney Day Robinson [ ] (1872 – 1947) in 1908. Keen to commemorate Emily’s ties to Trafalgar, they named their sons Sidney Joseph Atcherley Robinson [ ], Arthur Gordon Atcherley Robinson [ ], Richard Hector Horatio Robinson [ ], and Louis William Atcherley Robinson [ ]. Horatio, given as the third forename of Richard Robinson, must of course have been in honour of the architect of Britain’s victory at Trafalgar, Lord Nelson. Appropriately enough, when John Thomas Preston retired from the police force, he moved with his family to Nelson Road in Harrow Middlesex – and ran a beer house named, of course, the Lord Nelson. The 1911 census shows the occupation of John Thomas Preston as police pensioner / beer seller (own account, at home). Daughters Louisa and Maud were working for a draper. But John’s wife Emily, and their son Frank Atchley Preston, were “assisting in the business”. The historical record therefore shows that while James Atcherley served under Lord Nelson, his granddaughter Emily and great grandson Frank served in the Lord Nelson. Let us now turn to the sister of Ann Dennis, née Atcherley: Eleonora, who was born on 6 June 1811 in Southwark. I have yet to find Eleonora on the 1841 census, but in 1851 and 1861 she was enumerated with her husband, Bristol-born Robert Meares [ ], in Battersea (1851) and then in Chelsea (1861). Robert earned his living as a collector at a steam boat pier; there is no evidence of any children. This all seems perfectly normal, but Robert and Eleonora Atcherley – apparently a respectable married couple in 1851 – were not wed until 15 April 1852! In describing herself as Mrs Meares when she was not actually married to Robert, Eleonora was only following the example set by her mother, Sarah Perkins, who always told officials (including census enumerators) that her name was Sarah Atcherley. However, this was not the only discrepancy in Eleonora’s marital history. Her wedding to Robert Meares was the third to her name, and the circumstances of the first two are, to say the least, interesting. On 27 November 1832, at the church of St Bride in Fleet Street, London (pictured left), “John Wallace of this Parish Bachelor and Eleonara Atcherley of this Parish Spinster” were married, after the calling of banns. Whether Eleonora’s father James attended this event – indeed whether he even knew about it – I do not know, as the witnesses who signed the register were James E Good and Sarah Good (who acted as witnesses for other ceremonies recorded in the same register). Eleonora went on to plight her troth for a second time on 12 May 1836, at Wells Next The Sea in Norfolk, to James Wemyss, of that parish, a widower. Once again the witnesses, Elizabeth Newsom and John Massingham, were not family members. But the most peculiar thing about the service was that the bride went through it as “Eleanora Atcherley of this Parish, single woman”. It was as if Eleonora’s marriage to John Wallace had never happened. QUEEN-SQUARE.—Bigamy.—James Weemys, a middle aged man, of a very respectable appearance, was yesterday brought before Mr. Hoskins, charged with bigamy. Elenora Atcherly, a very interesting looking woman, stated that she was married to the prisoner at St. Bride’s Church, Fleet-street, on 27th of November, 1832. He married her in the name of John Wallace, and they had lived together ever since, in Brook-street, Lambeth. She had since ascertained that he had been previously married, and that his wife was still living; and in consequence of his ill-usage towards her, she gave information of the fact to a police constable. Thomas Stroud, of the L division, No. 174, produced the certificates of both marriages; and it appeared that he was married to a woman of the name of Mary Williams, on the 2nd of January, 1826, at Newington. On taking the prisoner into custody he did not deny having two wives; but looking sternly at Atcherly, asked her whether she meant it, and she replied that she did, for his ill treatment to her. The prisoner remained perfectly silent, and Mr. Hoskins ordered him to be remanded, so that the first wife might have an opportunity of appearing against him. James Weemys (or Wemyss) [ ] returned to court eight days later, on 12 May 1835. However, “neither of the wives attended, and the prisoner was discharged, the magistrate remarking that he might be re-apprehended at any future period.” It appears that James was never prosecuted for bigamy – but if he was still legally wed to Mary Williams, his marriage to Eleonora Atcherley was invalid. This gave Eleonora an opportunity to be rid of James Weemys and his ill treatment, but as we have seen, it was on opportunity she did not take. The couple patched things up and went through a second ceremony in Norfolk – a year to the day after James escaped from prosecution. Was the wedding at Wells Next The Sea any more valid that the one at St Bride’s? James used his real name the second time around, but I can’t help wondering whether he really was by then a widower – the fate of his first wife remains a mystery to me. As does James’s own fate. When Eleonora Weemys, daughter of James Atcherley, tied the knot with Robert Meares in 1852, she stated that she was a widow. However I have not found a death record or burial which I can link with any certainty to her first husband. She took her vows at the altar three times during her lifetime, but was Eleonora Atcherley ever legally married? The death of Eleonora Meares was registered at Wandsworth in the second quarter of 1866. She was 54. Robert Meares remained in Chelsea, working as a collector for the City Steamboat Company, until his own death, at the age of 67, on 3 January 1875. Administration of Robert’s will was granted, at the Principal Registry in London on 24 March 1875, to the universal legatee – Eleonora’s sister, Ann Dennis. Picture credits. Camberwell Old Cemetery: Adapted from a photo Loz Pycock, taken from Flickr and used, and made available for re-use, under a Creative Commons licence. 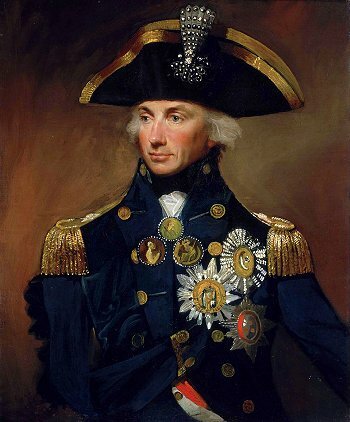 Horatio Nelson: Adapted from a public domain image at Wikimedia Commons. 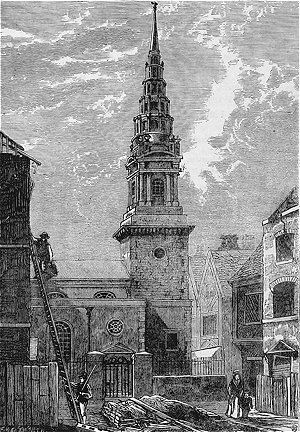 St Bride’s Church: Adapted from an image taken from the British Library Flick photostream, original image from Old and New London, etc., published 1887 – no known copyright restrictions. Marriage of Henry Dennis and Ann Atckerley [= Atcherley] registered at Newington, December quarter 1838; volume 4, page 421. Newington St Mary, Surrey, marriage register covering 1838, entry for Henry Dennis and Ann Atcherley. Copy viewed at Ancestry – London, England, Church of England Marriages and Banns, 1754-1921. Southwark St George the Martyr, Surrey, baptism register covering 1813, entry dated 26 Dec for Ann Atcherley. Copy viewed at Ancestry – London, England, Church of England Births and Baptisms, 1813-1906. Indexed at FamilySearch, Batch C02296-4, Film 394841, Ref ID yr 1813-1814. Clerkenwell St James, baptism register covering 1809, entry dated 14 Apr for “Henry: of George and Susannah Dennis” born on 28 Oct 1808. 1841 census of England And Wales. Piece 1065, book 9, folio 7, page 7. George Street, Newington, Surrey. Henry Dennis, 30, cabinet m j [= cabinet maker journeyman], born in county. Ann Dennis, 25, born in county. Selina Reynolds, 30, ind, born in county. 1851 census of England And Wales. Piece 1572, folio 651, page 25. 35 St Albans Street, Lambeth, Surrey. Head: Henry Dennis, 39, cabinet maker, born Islington, Middlesex. Wife: Ann Dennis, 35, born Southwark. Son: Henry Dennis, 9, born Lambeth. Dau: Ann Dennis, 6, born Newington. Dau: Eleanor Dennis, 4, born Islington, Middlesex. Dau: Emily Dennis, 1, born Lambeth. 1861 census of England And Wales. Piece 353, folio 71, page 18. 55 Bird Street, Lambeth, Surrey. Head: Henry Dennis, 32 [= 52], cabinet maker, born Clerkenwell, Middlesex. Wife: Ann Dennis, 47, born St Georges. Dau: Ann Dennis, 16, ironer, born Newington. Dau: Eleanora Dennis, 14, born Clerkenwell, Middlesex. Dau: Emily Dennis, 11, born Lambeth. Son: Robert Dennis, 8, born Lambeth. Son: Frederick Dennis, 4, born Lambeth. 1871 census of England And Wales. Piece 599, folio 124, page 52. 51 Hunter Street, St George the Martyr, Surrey. Head: Henry Denis, 62, cabinet [= cabinet maker], born London. Wife: Ann Denis, 57, born London. Son: Robert Dennis, 18, shopman, born London. Dau: Ann Dennis, 26, barmaid, born London. Son: Frederick Dennis, 14, born London. Death of Henry Dennis registered at Camberwell, June quarter 1878; volume 1d, page 511; age given as 69. Camberwell Old Cemetery, London Borough of Southwark, burial register (grave reference 49/5831), abstract viewed at Deceased Online. 1871 census of England And Wales. 63 Blakes Road, Camberwell, Surrey. Piece 696, folio 41, page 13. Head: James R Parsons, 35, hot water engineer, born Walworth. Wife and 5 children, including Samuel Parsons, 4 days, born Camberwell. Nurse: Ann Dennis, widow, 67, nurse SM, born Walworth. Death of Ann Dennis registered at Camberwell, June quarter 1882; volume 1d, page 521; age given as 68. Camberwell Old Cemetery, London Borough of Southwark, burial register covering 1882 (entry 53049), copy viewed at Deceased Online (name transcribed as Anna Dennis). 1881 census of England And Wales. Piece 697, folio 136, page 27. 118 Gloucester Road, Camberwell, Surrey. Head: Robt Dennis, unmarried, 28, cabinet maker, born Kennington. Brother: Fredk Dennis, unmarried, 24, packer, born Lambeth. Head: Hy E Tilley, 39, blind maker, born Lambeth. Wife: Ann Tilley, 36, born Peckham. Son: Hy Geo Tilley, 6, born Peckham. Dau: Annie Jane Tilley, 2, born Peckham. Son: Robt Edwin Tilley, 10 months, born Peckham. Note: The Dennis brothers and the Tilley family – along with the Wetheridge family (husband, wife and 5 children) – were living as separate households at the same address. Birth of Henry Dennis registered at Shoreditch, December quarter 1839; volume 2, page 318; mother’s maiden name Atcherley. Birth of Henry Dennis registered at Newington, December quarter 1841; volume 4, page 301. Death of Henry Dennis registered at Newington, June quarter 1856; volume 1d, page 135. Note: Cannot be certain that this relates. Birth of Robert Dennis registered at Lambeth, December quarter 1852; volume 1d, page 290. Death of Robert Dennis registered at Wandsworth, June quarter 1907; volume 1d, page 290; age given as 56. Note: Cannot be certain that this relates. Birth of Frederick Dennis registered at Lambeth, June quarter 1857; volume 1d, page 502. Death of Frederick Dennis registered at Camberwell, December quarter 1881; volume 1d, page 541; age given as 24. Birth of Eleanora Sarah Dennis registered March quarter 1847, Clerkenwell; volume 3, page 101. Death of Ellenora Sarah Miell registered at St Saviour Southwark, June quarter 1878; volume 1d, page 119; age given as 31. Birth of Richard Miell registered at Camberwell, June quarter 1850; volume 4, page 69. Death of Richard Miell registered at Steyning, March quarter 1917; volume 2b, page 483; age given as 66. Marriage of Richard Miell and Eleonora Sarah Dennis registered at St Saviour Southwark, March quarter 1870; volume 1d, page 52. Newington Trinity, Surrey, marriage covering 1870, entry dated 27 Mar for Richard Miell and Eleanora Sarah Dennis. Copy viewed at Ancestry – London, England, Church of England Marriages and Banns, 1754-1921. Birth of Ann Dennis registered at Newington, March quarter 1845; volume 4, page 373. Death of Ann Tilley registered at Camberwell, March quarter 1924; volume 1d, page 1155; age given as 79. Birth of Henry Tilley registered at Lambeth, December quarter 1841; volume 4, page 286. Death of Henry Edwin Tilley registered at Camberwell, June quarter 1895; volume 1d, page 510; age given as 53. Marriage of Henry Edwin Tilley and Ann Dennis registered at Camberwell, March quarter 1873; volume 1d, page 737. Camberwell St George, Surrey, marriage register covering 1873, entry dated 2 Mar for Henry Edwin Tilley and Ann Dennis. Copy viewed at Ancestry – London, England, Church of England Marriages and Banns, 1754-1921. Birth of Elizabeth Atcherly Tilley registered at Camberwell, March quarter 1885; volume 1d, page 996. Marriage of Albert V O’Neill and Elizabeth A Tilley registered at Camberwell, September quarter 1910; volume 1d, page 1646. Death of Elizabeth A O’Neill registered at Croydon, June quarter 1964; volume 5g, page 3; age given as 79. National Probate Calendar (1964) shows: Elizabeth Atcherly O’Neill. Of 26 Christian Fields London S.W.16. Wife of Albert Victor O’Neill. Died 31 March 1964. Administration granted to Albert Victor O’Neill. Effects £468. Copy viewed at Ancestry. Re:-Atcherley Family. At: Ancestry Message Boards (Message dated 14 Mar 2010, posted by M_PInsonBerthet). Birth of Emily Dennis registered at Lambeth, March quarter 1850; volume 4, page 308. Marriage of John Thomas Preston and Emily Dennis registered at Camberwell, September quarter 1876; volume 1d, page 1054. Camberwell St George, Surrey, marriage register covering 1876, entry for John Thomas Preston and Emily Dennis. Copy viewed at Ancestry – London, England, Church of England Marriages and Banns, 1754-1921. Birth of John Thomas Preston registered at Islington, March quarter 1851; volume 3, page 303. Death of John T Preston registered at Hendon, March quarter 1913; volume 3a, page 392; age given as 62. National Probate Calendar (1913) shows: John Thomas Preston. Of Lord Nelson, Nelson Road, Harrow, Middlesex. Died 5 January 1913. Administration granted to Emily Preston (widow). Effects £99. Copy viewed at Ancestry. Birth of Frank Atchley Preston registered at Hampstead, December quarter 1892; volume 1a, page 613. Birth of Emily Preston registered at St George’s Hanover Square, September quarter 1878; volume 1a, page 467. Death of Emily Robinson registered at Worthing, June quarter 1957; volume 5h, page 630; age given as 79. National Probate Calendar (1957) shows: Emily Robinson. Of 65 Queen Street, Littlehampton. Sussex. Widow. Died 22 May 1957. Administration granted to Sidney Joseph Robinson (maintenance fitter). Effects £93 6s. 4d. Copy viewed at Ancestry. Birth of Sidney Day Robinson registered at East Preston, September quarter 1872; volume 2b, page 324. Death of Sidney D Robinson registered at Chichester, June quarter 1947; volume 5h, page 432; age given as 74. National Probate Calendar (1948) shows: Sidney Day Robinson. Of 56 Queen Street, Littlehampton, Sussex. Died 22 March 1947 at Graylingwell Hospital, Chichester. Administration (with Will) granted to Emily Robinson (widow) and Arthur Gordon Robinson (marine engineer). Effects £1450. Copy viewed at Ancestry. Birth of Sidney Joseph A Robinson registered at Steyning, March quarter 1910; volume 2b, page 246b. 1911 census of England and Wales. Piece 5207, schedule 198. 35 Franklin Road, Portslade by Sea, Hove, Sussex. Head: Sidney Day Robinson, 38, married, master mariner (mercantile marine), born Littlehampton. Wife: Emily Robinson, 32, married (2 years, 1 child – living), born Camberwell, London. Son: Sidney Joseph Atcherley Robinson, 1, born Portslade. Birth of Arthur G A Robinson registered at Steyning, March quarter 1912; volume 2b, page 492; mother’s maiden name Preston. National Probate Calendar (1961) shows: Arthur Gordon Atcherley Robinson. Of 65 Queen Street, Littlehampton. Died 20 August 1961, at sea. Probate granted to Louis William Atcherley Robinson (electrical engineer). Effects £2586 12s. 11d. Copy viewed at Ancestry. Birth of Richard H H Robinson registered at Rye, March quarter 1915; volume 2b, page 6; mother’s maiden name Preston. Death of Richard Hector H Robinson registered at Worthing, January 1984; volume 18, page 2439; date of birth given as 27 Jan 1915. Birth of Louis W A Robinson registered at Preston, September quarter 1925; volume 2b, page 526; mother’s maiden name Preston. Death of Louis W A Robinson registered at Worthing, March quarter 1964; volume 5h, page 946; age given as 39. National Probate Calendar (1964) shows: Louis William Atcherley Robinson. Of 65 Queen Street. Died 22 March 1964. Probate granted to Richard Hector Horatio Robinson (engineer). Effects £10752. Copy viewed at Ancestry. 1911 census of England and Wales. Piece 7076, schedule 233 Lord Nelson, Nelson Road, Harrow, Middlesex. Head: John Thomas Preston, 63, married, police pensioner / beer seller (own account, at home), born Islington. Wife: Emily Preston, 60, married (34 years, 10 children, all living), assisting in business, born Lambeth. Dau: Louisa Preston, 23, single, draper’s assistant, born Hampstead. Dau: Maud Preston, 22, single, draper’s assistant, born Hampstead. Son: Frank Atchley Preston, 18, single, assisting in business, born Hampstead. Newington St Mary, Surrey, baptism register covering 1818, entry dated 2 Jan for Eleonora Atcherley. Copy viewed at Ancestry – London, England, Church of England Births and Baptisms, 1813-1906. Indexed at FamilySearch, Batch C05563-1, Film 307696, 307697, 307698, 307699. 1851 census of England Wales. Piece 1577, folio 31, page 1. Marsh Lane, Battersea, Surrey. Head: Robert Mears, 43, collector at steam boat pier, born Bristol, Somerset. Wife: Elenora Mears, 39, dressmaker, born Southwark, Surrey. 1861 census of England Wales. Piece 30, folio 48, page 22. 2 Milman Row, Chelsea, Middlesex. Head: Thomas Drake, 52, Inspector of Police, born Hollingsbury, Essex. Wife, daughter, son. Lodger: Robert Meares, 53, collector at steam boat pier, born Bristol, Somerset. Wife: Elenora Meares, 49, born Southwark, Surrey. Plus another lodger. Marriage of Robert Meares and Eleanora Weemys registered at East London, June quarter 1852; volume 1c, page 27. St Botolph Without Bishopsgate, City of London, marriage register covering 1852, entry for Robert Meares and Eleonora Weemys. Copy viewed at Ancestry – London, England, Church of England Marriages and Banns, 1754-1921. St Bride, City of London, marriage register covering 1832, entry for James Weemys and Eleonora Atcherley. Copy viewed at Ancestry – London, England, Church of England Marriages and Banns, 1754-1921. Morning Advertiser, 5 May 1835, page 3. Queen-Square.—Bigamy. Copy viewed at Findmypast. The Evening Chronicle, 12 May 1835, page 4. Queen-Square. Bigamy. Copy viewed at Findmypast. Death of Eleanora Meares registered at Wandsworth, June quarter 1866; volume 1d, page 324; age given as 54. 1861 census of England Wales. Piece 74, folio 22, page 35. Church Street, Chelsea, Middlesex. Head: Edward Cromar, 51, grainer & painter, born Chelsea. Wife, 2 sons, 1 step son, niece. Lodger: Robert Meares, widower, 63, collector to City Steamboat Company, born Bristol. Plus 2 servants. Death of Robert Meares registered at Chelsea, March quarter 1875; volume 1a, page 198; age given as 67. National Probate Calendar (1875) shows: Robert Meares. Late of Lindsey House, Millman’s Row, Chelsea, Middlesex. Died 3 January 1875, at Lindsey House. Administration (with Will) granted to Ann Dennis (wife of Henry Dennis), of 111 Gloucester Road, St George’s Road, Camberwell, Surrey, the Universal Legatee. Effects under £50.